Before you drop some valuable dollars on a larger hard drive, have you ever stopped to consider how much of your disk space is taken up by duplicate files? That's the thing about duplicate files - most times, you aren't even aware of their existence! Sometimes entire directories get duplicated when you accidentally execute a copy operation when you intended to move the files. Other times, you'll download files into different directories, or updated software versions change where their configuration files are stored, without deleting the old ones. No matter what the cause, you can be certain that Duplicate File Detective will root out all of your duplicate files quickly and easily! Duplicate File Detective is a brilliant piece of file management software that identifies all of the duplicate files across multiple directories, drives, even network shares, and lets you move, compress, or delete them in a snap. You'll instantly experience increased system and application performance when you give your computer lots of elbow room to move! And with native 64-bit support, you never have to worry about having too many duplicate files in too many locations, because Duplicate File Detective will handle it all with ease. A sleek and intuitive interface gives you the power to customize your Duplicate File Detective experience! Dock panels wherever you like, set the program to auto-hide, or close panels entirely - it's all up to you. Have you been burned by other duplicate file managers that deleted songs that weren't actually duplicates? 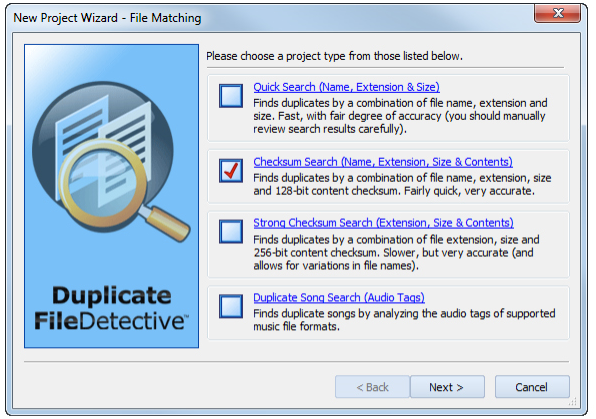 Duplicate File Detective has advanced support for duplicate song detection, comparing audio tags, bit rates, duration, and so much more - virtually ensuring that if a song is marked as a duplicate, it is TRULY a duplicate. The program even has the ability to peek inside of ZIP archives to ensure that duplicate ZIP files aren't missed, even if they have different header values! Best of all, new hash value storage means even quicker duplicate detection in future sessions! 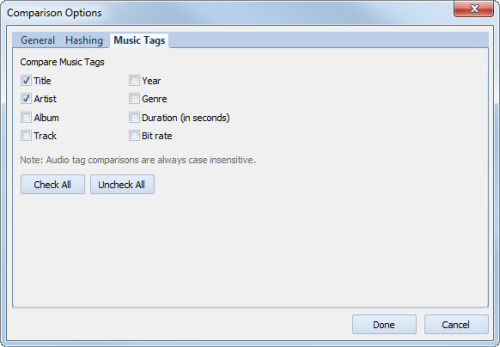 Support for comparison of song title, artist, album, track, year, genre, duration, and bit rate. 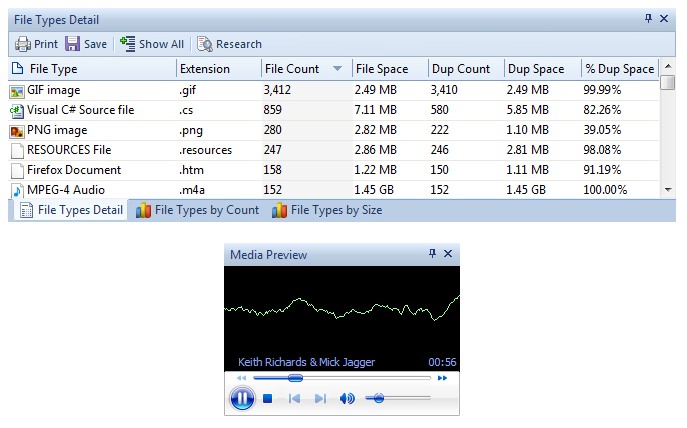 SmartMark technology enhanced to mark duplicate files by audio file duration and bit rate. 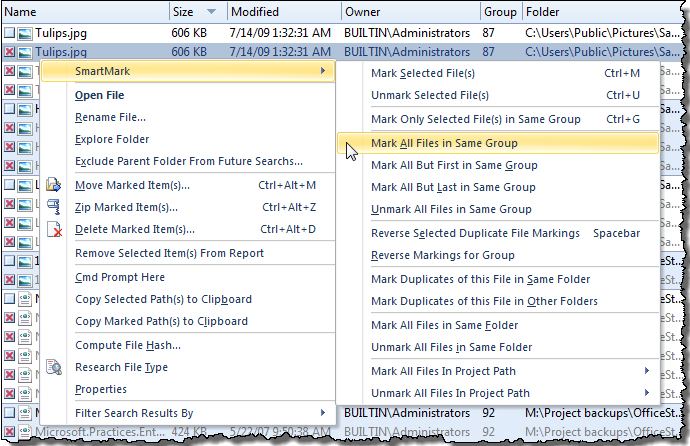 Improved file comparison algorithms eliminate the need for hashing in many duplicate search scenarios. Native 64-bit builds offer improved performance (and scalability) in 64-bit computing environments. Support for HTTP proxy authentication during update checking. Support for default x64 path exclusions on x64 platforms. Automatic syncing of duplicate search results columns when changing comparison options. Byte-for-byte duplicate file match confirmation capability. Improved use of multi-core processor computers with multi-threaded file content hashing system. Multiple paths can be searched in a single pass. Network enabled> - scans both local and network file systems. Reports can be exported in HTML, CSV, and XML formats; XML report exports can be re-imported at a later time. Multiple improvements to Search Path and Exclusion docking panels, including conflict resolution system. Integrated command line support for batching, scheduling. Integrated image preview panel for quick visual comparisons. 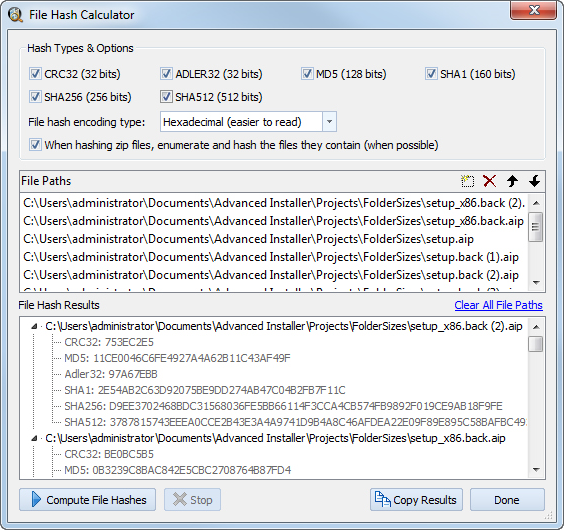 A file checksum calculator tool. After you purchase Duplicate File Detective 6.0 it may be used indefinitely. Duplicate File Detective 6.0 is licensed per computer, and not per user. Key Metric Software @Matt: Sounds like possible Windows shell icon cache corruption. Please contact support@duplicate-file-detective.com and we'll help out. Thank you for suggesting Windows icon cache corruption as a cause for 'black icons'. I deleted my icon cache database and now all folder icons are displaying properly. Key Metric Software @Jeremy: Yes, mapped drives are supported (as are UNC paths). Jos Andries looks like the previous version  to me + update [to 6] = normal price, if I got that right? ... In that case, where lies the promo? Constantin Florea @Jos Andries, I am sorry about the issue. I have just contacted the vendor to see if he wants to continue running the EveryDay deal for this product. Constantin Florea @Jos Andries, The EveryDay deal for version 6 of the product has been updated and is now active. You may participate in the promotion by clicking the Get This Deal button at the top of this promotion page. Jos Andries hello and thanks for the feedback. Techfixes It's a lousy deal. Extremely high-priced Software in a category where they are dime a dozen. No thanks. Alexandre Emeriau Is it a lifetime edition ? Alexandre Emeriau What about computer number covered ? Kat D What document file types can it preview, if any? (txt, html, docx, pdf, etc) Is side-by-side document preview comparison possible? There are soooo many duplicate deleters out there and they all seem to have users delete files "blindly." JOI This is really top-notch software... If you are serious about what you are deleting from your drive and want a bit more insight into what it is you are deleting this is the program for you. With this software, it will be very difficult for you to delete the wrong files or all of the files given the way the information is presented and it also has a nice small preview window for files. In software, you usually get what you pay for.